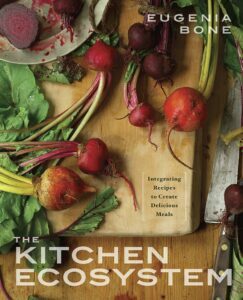 Eugenia Bone is a long time food writer, author of five books (Her fifth, The Kitchen Ecosystem, was just released in September), an Italian cook, mushroom hunter, master canner, and all-around bloated pleasure seeker. Her stories have appeared in newspapers and magazines across the country, from The New York Times Magazine to The National Lampoon, Epicurious, Saveur, Food & Wine, Gourmet, Fine Cooking, The Wine Enthusiast, and Martha Stewart Living, among many others. She also writes a blog, Well-Preserved, about food preservation and the ecosystem of the kitchen, for the Denver Post, and is co-president of the New York Mycological Society. A sought-after lecturer, occasional teacher and live presenter of preserving and mushroom cooking, she can be found in venues like the Museum of Natural History, the Denver Botanical Gardens, and the New York Botanical Gardens sharing her expertise with foodies and foragers alike. 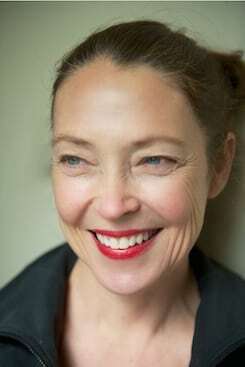 Though her first 3 books received global recognition, including a James Beard Award nomination and numerous “Best Book” lists, it was her fourth book, Mycophilia, that she claims was the most profound writing experience of her career. Louie (LS): What did you know about mushrooms when you started out writing Mycophilia? Eugenia (EB): I didn’t know jack about mushrooms, but then I learned some basic stuff and learned that fungi is everywhere. That totally surprised me. I started reading and studying and learning more. I became increasingly obsessed and met all of these strange amateur mycologists, this really quirky crowd, and became an aficionado in the culture of amateur mycology. But what was really transformational for me was that through fungi, I came to understand nature in a deeper way. Fungi was the window through which I accessed a more complex picture of biology. How things are interrelated. It was a spiritual experience. LS: It’s sort of the foundation of life. Do you see it as decomposition or composition? Is it the beginning or the end of life? EB: (laughs) Yeah! Yeah. God. I guess it’s both, you know, because a cycle is a cycle. Fungi effects weather, weather effects plants, plants effect mammals, mammals effect bacteria. Cycles aren’t even where its at. It’s more of a web. LS: So, how did you eventually get into this beloved relationships with mushrooms. EB: Through culinary. I loved wild mushrooms. I’d seen them wanted to be better at getting them. Seen them wild in a place I have in Colorado. When the season’s good, they are copious. I wanted to become prolific at gathering wild mushrooms. I grew up in an Italian household and we didn’t do sporty things like sailing, we foraged. Dandelions, blueberries and mushrooms. Photo credits: Ben Fink shot the food image and the author’s picture is by Huger Foote. Have a Q for Eugenia to A? Have questions for Eugenia about mushroom cooking or preserving? Post your question in the comments section below and she will be responding to select questions over the next week. PS…enjoyed Mycophilia…wrote a review of it for our Minnesota Mycologist Society. I loved Mycophilia too. Great book. I second the request for your thoughts on sott’olio preservation. I am so happy you both liked Mycophilia! Okay, regarding preserving in oil. The USDA tells us that a food preserved under oil in the fridge will last 10 days. I have found that cooked marinated mushrooms sometimes keep longer, other times they ferment. It is a matter of what kind of spoiler gets into the jar and when. It is not recommended to preserve a food under oil at room temperatures. Here’s why: the bacteria that causes botulism poisoning needs an airless environment, room temperature, moisture, and food in order to produce toxin. All these criteria are met by preserving mushrooms in oil without refrigeration. The bacteria can survive sterilization, so you can’t just boil everything first. If the mushroom preserve has a little vinegar it will likely last longer in the fridge. If the mushroom preserve has adequate vinegar it can be water bath preserved and will be shelf stable. And my go-to mushroom sauce? Melt a hunk of butter and a drizzle of olive oil in a well-seasoned iron skillet. Add a big pinch of freshly chopped garlic or twice as much minced shallot. Add the mushrooms and cook until they release their water. Add a good splash of dry Marsala and a small handful of chopped fresh thyme leaves, salt and freshly ground black pepper to taste. Reduce the liquid by two thirds, and then add another hunk of butter. This, on top of spaghettini that has been cooked in chicken stock (not water—you need about 1 pint of stock for ¼ lb of spaghettini), and garnished with a bit of grated Parmesan is divine. But I also throw these mushrooms into the pan at the end of a chicken braise, serve them on top of a steak or meatballs, sprinkle them over a pizza with grated gruyere, add to grilled Swiss cheese and finely chopped hazelnut sandwiches, pour them into the bottom of a ramekin, crack an egg on top, cover and poach in a ban marie until the egg whites are cooked, and garnish a watercress salad. I think if you send questions every few days that would be great! How do you clean mushrooms – Maitake in particular I have found to be quite a challenge. Is there a good way to chase the bugs out? Heat perhaps? Salt water? 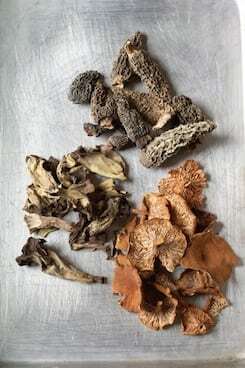 I brought in a 15 pound haul last weekend and spent four hours cleaning, cutting, and [drying/freezing/sauteeing] the mushrooms, not to mention chasing bugs, cleaning up, and (of course) researching this question online. your reply is wonderful and the recipe sound delicious. Thank you.